This print and a companion piece, ID # 1013.02, "Cosmgrarhy and Astrology," are from Richard Blome's "The Gentleman's Recreation". Both of them show the diverse ways in which geography and cosmography can be applied. Although "The Gentleman's Recreation" was published in various editions from 1686 forward, this plate bears a dedication date of 1678. 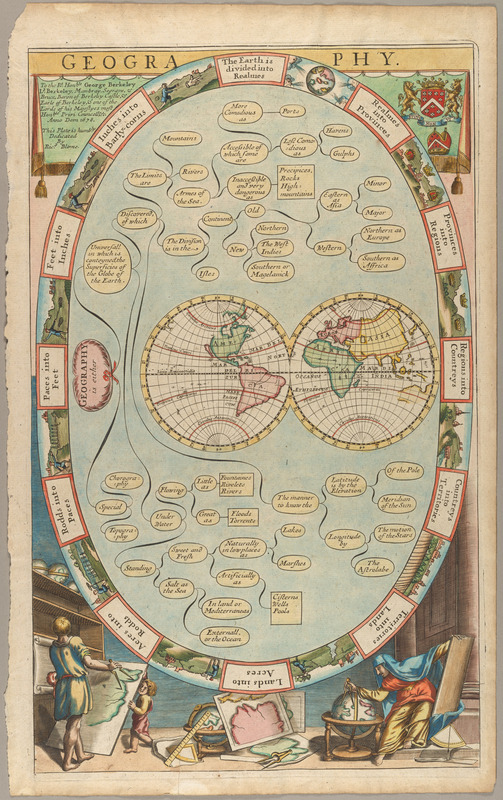 It includes a map of the world in two hemispheres, with California as an island. See generally Shirley # 479; Delaney 2012, 223, 225.